“What? !” I replied. My shock was in reaction to two points: 1) the notion of having to sleep on the street all night for tickets to the show and 2) the fact that it appeared I’d forgotten what happened last year. I missed out last summer with Twelfth Night and vowed to shun the free production this year out of anger. “I’ll show them!” But much like one in an abusive relationship, I came crawling back. I’d never read or seen a production of Merchant before, and wasn’t too intrigued by what I heard of the story. I’m also not a huge fan of Al Pacino’s (who stars as Shylock in this production). But with last year’s Twelfth Night debacle, I was supposed to pick up a ticket for my mom, and she, like the rest of my friends and myself, was incredibly disappointed when we didn’t get tickets. This was my year to make it up to her. I made up my mind to forgo a night of sleep and comfort and take the Shakespeare in the Park plunge. But if I was going to do this, I was going to do it well. I wanted to beat this game, so I arrived at the line on Central Park West at 2 a.m. (Central Park doesn’t officially open until 6 p.m., so until then, ticket hopefuls must line up here.) Yet even at this aggressive time, there were still about 150 ahead of me! The line began on Central Park West at 81 St. and stretched to 85 St. at 2 a.m., which is where I set up shop. Sleeping on the street is such a bizarre experience. This varies with every person, but with me, there isn’t much sleeping. So between nodding off for 10 or 15-minute intervals and zoning out, time becomes a dreamlike blur. Although a hazy experience, it luckily makes the hours not seem such a hardship. I was so grateful for the 6 a.m. migration to our permanent places in Central Park. 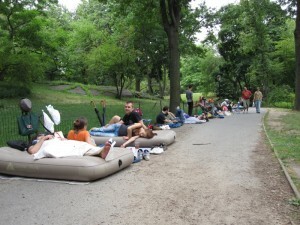 Camping out on Central Park West feels so vulnerable and… cobblestoney. (Really, flat surfaces, please.) From then on in my spot in the line in the park, the experience had its enjoyable moments. In the wee hours of the morning, dogs are allowed off leash, and the four-legged cuties that trotted by me really lifted by zombie-ish demeanor. I’ve always had a love affair with Central Park, so having to spend so many hours in it, watching the sun rise, viewing the scenic juxtaposition between the trees and the gothic buildings was no torture. Forgetting about the trials of losing sleep and being uncomfortable for so many hours, it is a beautiful, peaceful activity to do in the summer. After I received my tickets, I asked a Public Theater line monitor what time they stopped admitting people to the line. His answer: 4:30 a.m. Flashback! Last year’s cut-off time for the day I tried for Twelfth Night tickets was 4 a.m.! So this year there was a 30-minute grace period? Rushers, Shakespeare in the Park has become far too difficult. While seeing shows (and sleeping on the street for tickets, if need be) is my job, I don’t know anyone who can sacrifice a full 24 hours to see a show. Yes, 24 hours. Besides prepping for camping out, I arrived at the line at 2 a.m., didn’t receive my tickets until 1 p.m., was unable to do anything but lay on my bed for the remainder of the afternoon, arrived at the Delacorte Theatre for the performance at 8 p.m., and left at 11 p.m. Crawling under my covers at 2 a.m. makes it a full 24 hours that my life was Merchant of Venice. Talk about an immersive theater experience! Who has the time in their life to do this? Apparently a lot of people, as every performance sells out. It’s wonderful that the Public Theater produces such fantastic, celebrity-filled shows. We’re fortunate to have this great organization. But the format or rules need to be changed, because this event has become nearly impossible to tackle. Of course, word on Central Park West is that The Winter’s Tale (or The One Without Al Pacino), which is playing in repertory with Merchant, has much shorter lines. Although the wallet was never touched, a cost came from other sources. A sleepless night, a sore bum, a delirious mind, and a full listen of The Secret audiobook later, The Merchant of Venice experience was ours. Was it worth it? My mom, who had never been to Shakespeare in the Park before, turned to me when it was over and said, “This was the best theatrical experience I’ve ever had.” You tell me. Have you tried for tickets to Shakespeare in the Park this summer, Rushers? What was your experience like? Do you enjoy the challenge of camping out, or does it make you stay in bed the entire next day? What do you think of the Public Theater’s ticket format and policy for Shakespeare in the Park? Let it all out in the comments! For last year’s show I got on Lind at 7:30 am. I did not get tickets at the one o’clock distribution. Stayed on line for cancellations until 7:30 pm when they started distributing tickets again and got in at 8 pm for the show. It was a twelve hour ordeal and I don’t think I would ever put myself through it again( although we did have a wonderful conversation with the two people ahead of us from 1to 7:30, so that helped pass all of those hours! You are right, the distribution policy for these productions is really inhumane, unless the show is a turkey and you can get tix at 6 pm go hzve dinner and return at 8 for curtain. @Joe B: You’re right about the difficulty in getting these tickets. I understand when you say you will probably never do it again, but I think that’s sad. Yet I don’t blame you. I’ll do it again, but it’s definitely a once-a-year thing, and there’s no way I could try for WINTER’S TALE. It’s just way too soon. The first summer I did Shakespeare in the Park, was the year of Hamlet and Hair. I saw Hair many times and never had a problem getting a ticket. I got there at 8 am on a Saturday once and was more than ok. And I always had a good time in line. I like spending the day in the park and I’ve met interesting people. But, you’re right, it’s gotten ridiculous. It’s one thing to spend the day in the park, but it’s another to have to spend the night on the street. I had conversations with a few people at the Public about this. They said they’ve tried other things in the past and so far, this is what works the best. They always bring up other options like standby and the virtual line, but the virtual line is nearly impossible, so the only way to guarantee tickets is to wait in that line or donate a lot of money. I blame the people who keep arriving earlier and earlier each year. If nobody showed up the night before, then there would be no need for this insanity. @Linda: I think you summed this up perfectly. I would LOVE to spend the morning/day in the park, but not sleep on the street overnight! And it’s so interesting that HAIR wasn’t difficult to get tickets to! I remember it being SO popular. But you’re right—I remember my friends and I got there 7:45AM on a Saturday and we were fine. Same with ROMEO AND JULIET the year before. Why did it explode last year with TWELFTH NIGHT? The celeb factor? How can we stop people from showing up the night before? And I feel guilty, because I was a part of it. I had no choice though, clearly. Well, either sleep on the street or don’t get tickets. @Liz: Yeah, you’re definitely right! Besides being very uncomfortable and LONG, it IS kind of fun, because it’s something we never do. It is an adventure, you’re right. Regarding safety, everyone asks me that. I feel like it’s a non issue, because you’re surrounded by dozens of people, even while you’re sleeping. But then again, I guess people have been shot/raped/stolen from in public sometime in history before. When the rich can hire illegal immigrants and the homeless to stand in line for for them it makes a mockery of the whole Shakespeare in the Park free ticket idea. It was supposed to bring Shakespere to the ordinary folk. Now the ordinary folk have to endure a 24 hour rigorous marathon to get in!